In 1955, sixty-three years ago, Stratford-upon-Avon experienced its most glamorous season of Shakespeare. 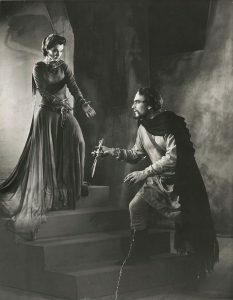 Laurence Olivier and his wife Vivien Leigh, the golden couple of stage and screen, performed in three plays at the Shakespeare Memorial Theatre: Twelfth Night (Malvolio and Viola), Macbeth (Macbeth and Lady Macbeth) and Titus Andronicus (Titus and Lavinia). 500,000 applications were received for the 80,000 tickets available for the whole season before the box office had even opened. Audiences were thrilled, but behind the scenes, the couple’s troubled marriage was finally breaking down. One of the major factors was the long-standing mental illness that had afflicted Vivien Leigh for well over ten years, perhaps much longer. She suffered from what is now known as bipolar disorder, then little understood. The only treatment for her dreadful attacks was electroconvulsive therapy, which Leigh endured several times with little success. She was a fine actor winning Academy Awards for playing Scarlett O’Hara in Gone With the Wind and Blanche in A Streetcar Named Desire, the second of these while already ill. But Leigh longed to be recognised as a classical actor in her own right even though she knew she could never compete with her husband, the most brilliant actor of the day. The couple had acted together before but the season at Stratford was particularly risky. The schedule was long and gruelling, and she would be compared directly with Olivier. Why on earth did she do it? It’s hard to imagine now that the professionals who had treated her were not able to dissuade her, but symptoms of bipolar disorder include increased energy, an unrealistic belief in one’s abilities and denial that anything is wrong. 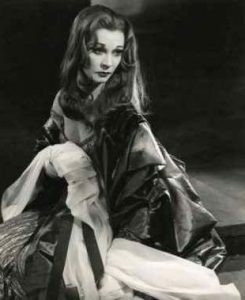 To his credit, Olivier had spent many years struggling with Leigh’s bouts of illness: “At these moments, Vivien turned into a stranger, whom he was seemingly incapable of helping”. By the end of the season Leigh was seriously ill. Typically, she blamed herself for her lukewarm reviews, saying she should have taken more risks with the roles. It would be some years later, after an international tour of Titus Andronicus in 1957, that they admitted their marriage was over. Vivien Leigh continued to act successfully for the next few years. It’s a pity that her strength of character, determination and talent are so little remembered amongst the more sensational aspects of her life. Her personal archive, including letters, photographs and diaries, is now publicly available at the Victoria and Albert Museum so her voice may be better heard. There’s a post here that includes a link to the catalogue. She died in 1967 aged only 53. It’s hard to imagine now that even relatively recently so little medical help or understanding was available to one so famous. Mental illness in general, and bipolar disorder in particular, now carries much less stigma and public figures are able to admit they are sufferers. There is though still much to do and 30 March is now designated World Bipolar Day with the aim of raising awareness of bipolar disorders and improving sensitivity towards the illness. This entry was posted in Legacy, Shakespeare on Stage and tagged Alexander Walker, Anthony Holden, Bipolar disorder, Laurence Olivier, mental illness, Vivien Leigh. Bookmark the permalink. Thanks for posting this well-considered article. I’ve become rather a booster of Vivien Leigh in recent years, as I see her so often dismissed as a “movie actress,” implying that she lacked stage skills, or even that her career was linked mostly to her appearance and personal qualities. But she had genuine successes in classic stage roles (Lady Teazle in School for Scandal, and Titania, were others). And that Macbeth production must have been something quite special. When I spin alternate-reality fantasies, I like to imagine a world in which Olivier’s “fourth” Shakespeare film was not Othello, but an adaptation of that Macbeth.